Flip™ Kit 03 20ft fabric exhibit incorporates layered, staggered walls that are connected to create a unique, dimensional and versatile display. 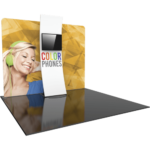 Double-sided stretch fabric graphics enable you to feature a different look, brand or messaging so you can SPIN from front to back or use as a creative space divider for a larger space. 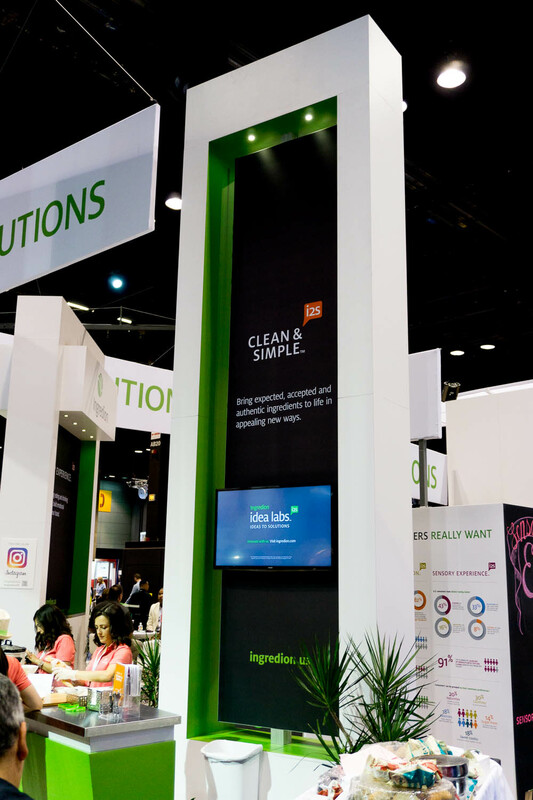 With an easy graphic change, you can also FLIP from top to bottom to create a new, different exhibit and look for your next event. Counters and lighting not included. Embrace™ 5ft full height (2 Quad x 3 Quad) is a sleek, collapsible, portable tabletop display that delivers style with minimal effort. Embrace 5ft full height (2 Quad x 3 Quad) features a sleek, collapsible anodized silver frame with channel bars that hold push-fit fabric graphics offered with or without endcaps. No tools are required for assembly. 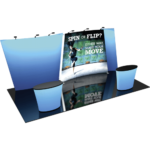 The lightweight and highly portable display packs away as easily as it sets up for the ideal tradeshow, event or retail display! Formulate® Designer Series 10ft Fabric backwall Kit 06 is sophisticaed and sharp looking display that includes an aluminum tube frame featuring snap button/spigot connections, a tubular kiosk supporting a medium monitor mount for multimedia display and simple pullover zipper pillowcase fabric graphics. Designer Series Kit 06 comes in two portable, expandable wheeled transit cases for easy storage and transport. Assembly and graphic attachment is easy – simply pull the pillowcase fabric graphics over the frame and zip.